Writers are forever being told that good stories rely on conflict or drama. "There is no story if the protagonist has to problem to solve!" cry the experts. Apparently the world isn't full of enough conflict, and we need to inflict yet more arguments, high stakes and the like on our lovely readers. Hell, I'm as guilty as anyone - I managed to cram a train robbery, two shoot outs, a hanging, a horse chase and a fist fight into The Guns of Retribution. But what if you're one of those really nice people who gets on with everyone, and is a joy to be around due to your sunny disposition and caring attitude? Where do you find your conflict? Personally, I recommend that you take a look at PassiveAggressiveNotes.com. 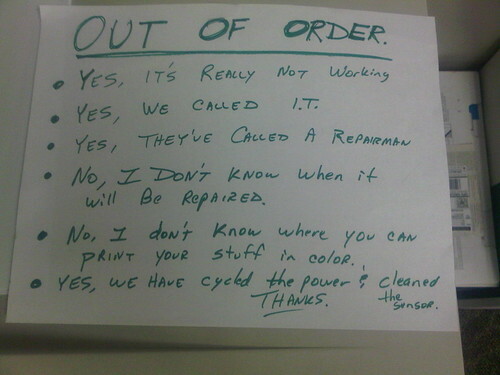 It's a blog that features notes written in a passive aggressive tone that are left for others. Some of them are downright hilarious, though if you're as fastidious about spelling and grammar as I am, then you might teeter on the edge of annoyance. Still, I can't help thinking that if you were to browse through some of these, you'd easily find some conflict that you could spin into a story...and who said stories full of conflict couldn't be funny? "But what if you're one of those really nice people who gets on with everyone, and is a joy to be around due to your sunny disposition and caring attitude?"